Jihad Watch : Jihad Watch reported Monday about a Muslim dentist, Nessreen Zayed, who joked about torturing her Zionist patients “with my pleasure” — disturbing, considering the level of trust given to those in the medical profession not only by their employers, but especially by their patients. But Zayed, of course, isn’t a first. A young medical resident of Palestinian descent, Lara Kollab, was fired from the Cleveland Clinic because of her threat to do harm to Jews, despite the Hippocratic oath to heal and not do harm. She routinely referred to Jews as “dogs” on social media, trivialized the Holocaust, and tweeted that she would “personally give all the Yahood the wrong meds.” When caught out, she issued a plainly disingenuous apology. Kern said Kollab “submitted information that was false, misleading, and incomplete to Kern Medical during the interview and match process.” It shouldn’t have gotten even that far. 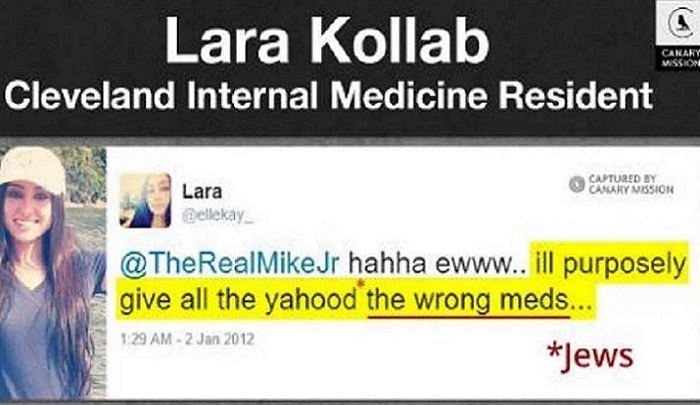 Robert Spencer asked the question does Lara Kollab still have a license to practice medicine? The answer should be a resounding no, Lara Kollab should not still have a license and she should never obtain a license to practice medicine; nor should Nessreen Zayed ever practice dentistry.